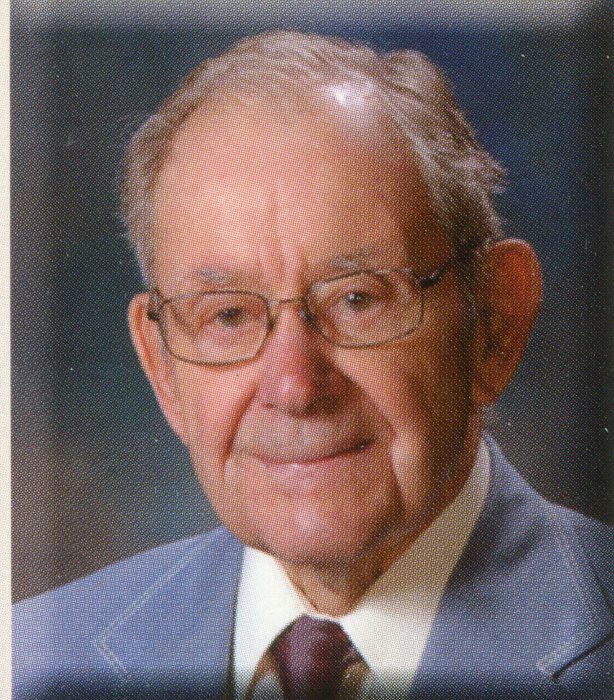 Obituary for Fred L. Egley, Jr.
Funeral Services for Fred L. Egley, Jr., 102, Norfolk, will be at 10:30 a.m., Friday, August 17, 2018 at the First United Methodist Church in Norfolk. Reverend Raponzil Drake will officiate. Burial will be in Prospect Hill Cemetery. Military honors conducted by the U.S. Navy Honor Guard and the American Legion Post 16 and VFW 1644. Visitation will be 4:00 to 7:00 p.m., Thursday at Home for Funerals Chapel, 708 Georgia Ave., Norfolk. Mr. Egley passed away Saturday, August 11, 2018 at Heritage of Bel Air in Norfolk. Fred Leonard Egley was born May 14, 1916 to his parents, Fred and Gladys (Anderson) Egley in Holdrege, Nebraska. He graduated from Lincoln High School in 1935. Fred obtained his Bachelor’s Degree in Education from UNL in 1939 and his Master’s Degree in 1950 from UNL. On August 25, 1940, Fred married Marie Strauch in Lincoln. They were a happy and devoted couple until Marie passed away August 24, 2004. They had two sons, Thomas and James. Fred came to Norfolk, after graduating from the University of Nebraska, as a teacher and coach for Norfolk Public Schools from 1939 to 1943. Fred then entered the United States Navy in 1943 through the end of World War II. He was Captain of P.T. boat 332, a Motor Torpedo boat and saw combat in New Guinea and the Philippines. He mourned the loss of two of his men who were killed by a Japanese suicide plane. After the end of his Navy service, Fred returned to Norfolk and taught one semester before moving to Ravenna, Nebraska where he and Marie owned and operated a grocery store. The following year, Fred returned to Norfolk and served as the Junior High principal from 1947 to 1969. From 1950 through 1967 he was also the athletic director for Norfolk Public Schools and Norfolk Junior College. He finished his career as an assistant principal from 1969 through 1981. In addition to his work as a coach and athletic director, Fred was a football and basketball official. He served on the Board of Control of the Nebraska School Activities Association from 1965 to 1970. Fred Egley was inducted into the Nebraska High School Sports Hall of Fame in 2012. At that time, Fred was recognized “as a motivator, counselor and supporter, contributing to the development and progress of coaches, teams, athletes and activities in Northeast Nebraska”. Fred loved fishing and duck hunting and pursued those passions as long as he was able to. He was a founding member of the Norfolk chapter of Ducks Unlimited, a wetlands conservation organization. He was also a board member of the local Pheasants Forever chapter when it was first organized. Fred Egley was well known as a man of substance and character who faithfully served his family, community, church and country. He was an exemplary teacher, coach and administrator. Most of all, Fred will be remembered as a kind and caring gentleman. Fred is survived by his son, James (Jeri) of Norfolk, daughter-in-law, Maxine Egley of California, grandchildren John (Karen) Egley, Molly (Jamie) Brummond, Sarah (Josh) DenHartog, Jessie (Mike) Saer, Jarrod (Emily) Egley, Josh (Emily) Egley, and Mary Beth (Joe) Petronis, 13 great grandchildren and sister, Evelyn Pollard of Lincoln. Fred was preceded in death by his wife, Marie, and brother, Max. Son, Thomas, died on March 18, 2018 in Mission Viejo, California. In lieu of flowers, memorials are requested to the Norfolk YMCA or the Norfolk Public Schools Foundation.